While some methods of crafting prayer beads or rosaries are more complex than others, making a basic circlet of prayer beads is simple.This set of prayer beads was created from materials purchased at a local discount department store; the cost was just under $6.00. I first chose the pendant/charm which would give the prayer beads their theme. 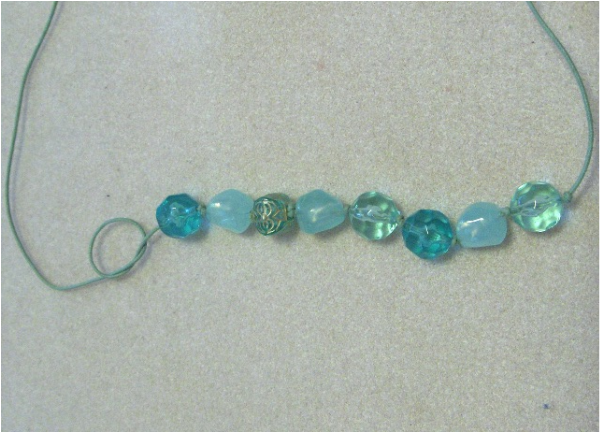 I decided on a Spirit of Water theme, with dragonfly charms, an assortment of blue beads, and sea green cord. (2mm size). You will also need a pair of scissors and a soft piece of cloth to keep the beads from rolling around on the work surface. Arrange the beads in a circle. Cut four feet of cord and knot one end. String on a charm and an accent bead. Then, make a knot six inches from the charm. String your first bead, sliding it down to the knot. (If the bead moves over the knot, make a second knot to hold the bead fast.) Make a knot on top of the bead. String on a second bead and make a knot, then tighten it down against the bead. Continue stringing beads, knotting between each one, until all the beads are strung. Reserve the second charm and accent bead to finish off. Bring the ends of the beads together and fasten with a square knot. Cut the excess cord, leaving two 6 inch strands. Thread on the second charm & bead. Arrange the charms/beads to desired length. Knot above and below each one. Tighten the knots and trim any excess cord.